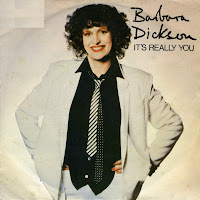 Barbara Dickson was born in Dunfermline, Fife, Scotland on September 27, 1947. She started singing in folk clubs around her native Fife in 1964. Her first solo album was 'Do right woman' in 1970. Ten years later she reached her commercial peak when she released 'The Barbara Dickson Album', produced by Alan Tarney. The album yielded two singles, of which 'January February' was the successful one and 'It's really you' flopped. Personally I think 'It's really you' is the better one of the two, being a rather bouncy poppy piece of work.